Feb. 10, 1913. "Washington hikers. 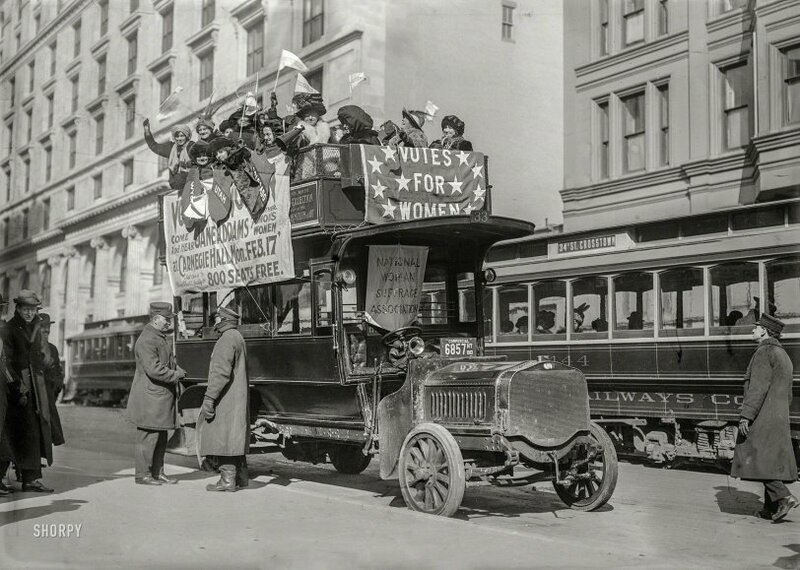 Suffragists on bus in New York City, part of the 'hike' to Washington, D.C., which joined the March 3, 1913, National American Woman Suffrage Association parade." 5x7 glass negative. View full size. Submitted by Bike Bubba on Fri, 04/05/2019 - 9:05am. Remembering that it's not a coincidence that the 18th and 19th Amendments are so close together, I'm guessing it's enthusiasm, not flasks, on top of that precarious bus. One of the big reasons for both Prohibition and women's suffrage was the horrendous damage done by excessive use of readily available distilled spirits. Submitted by Greenscaper on Thu, 04/04/2019 - 3:54pm. Judging by the smiles all around I suspect the ladies have a few flasks up there. Hear! Hear! Whenever I've read the archaic word suffrage I've wondered about the word source. So, I looked it up this time. Etymology. The word suffrage comes from Latin suffragium, meaning "vote", "political support", and the right to vote. Oh! no. Not more Latin as in horticulture. I've heard enough of that for one lifetime amidst the hortisauris community. Submitted by Lisa P1968 on Thu, 04/04/2019 - 2:10pm. The expressions on the women's faces that are on the trolley looking up at the suffragettes is interesting. It's hard to tell if they are indifferent, disgusted or in awe of them. Submitted by bobstothfang on Wed, 04/03/2019 - 12:59pm. I hope the driver doesn't go around any turns too fast. The center of gravity is a bit high and the vehicle might tip over.